The calotype, a negative-positive process patented in 1841 by William Henry Fox Talbot (1800-77), takes its name from the Greek word for beauty, kalos. Hill, a painter and secretary of the Royal Scottish Academy, employed the new photographic technique to make portrait studies as a preliminary step in creating a monumental work in oils. The painting (now in the collection of the Free Church of Scotland) commemorates a church convention in 1843 that severed ties with the British Crown to found the Free Church of Scotland. 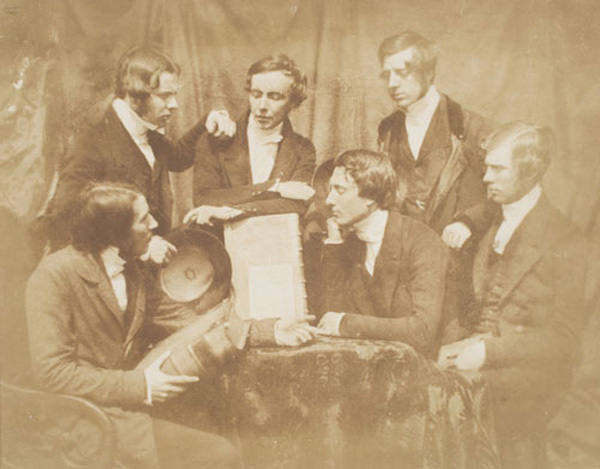 Hill sought the collaboration of Adamson, a Saint Andrews calotypist, to photograph the individual church delegates- among them the professor and one of the five ministers shown here. This "indoor" scene was actually staged outdoors to utilize sunlight for making the one- to two-minute exposure required to produce a satisfactory paper negative. It was one of fifteen hundred photographs the two artists took during a five-year period- including portraits, architectural subjects, and seaside scenes- before their partnership ended with Adamson's death in 1848.